App-based taxis have revolutionised the way people in India travel. Taxis arrive at any destination one wants at just the click of a button on the mobile phone. The problems of tackling the city traffic and struggling to find a parking space are now a thing of past. Although people are happy with the ease these app-based taxi services have bought into their lives, there are still some issues which have been bothering them. LocalCircles conducted a citizen pulse check through a 6-poll survey to figure out these pain areas. The first question asked the top reason why Indians use app-based taxis like Ola and Uber. 72% said they use it because of the convenience they provide and 16% said the reason was low fares. 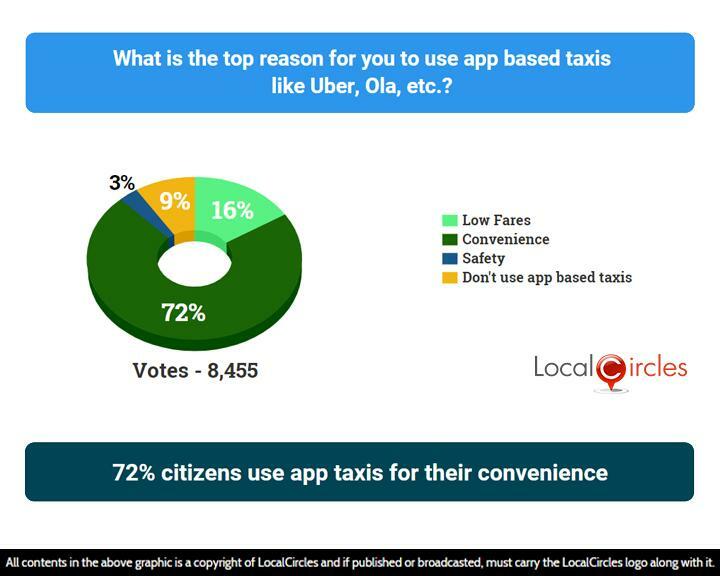 3% said they were safer than other means of transport while 9% said they don’t use app-based taxis. App-based taxi services have run into many controversies over the last few years. From allegations of surge pricing, to question raised on driver behaviour and women safety in late night cab rides, citizens have reported many issues that need to be addressed. 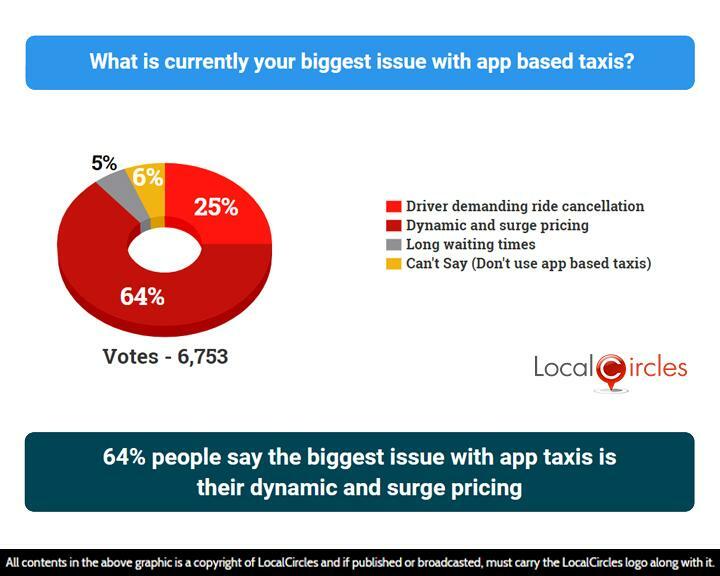 When asked what their biggest issue was with app-based taxi services, 64% pointed towards dynamic and surge pricing while 25% said drivers demanding ride cancellation is a big issue. 5% said long waiting times and 6% said they were unsure. 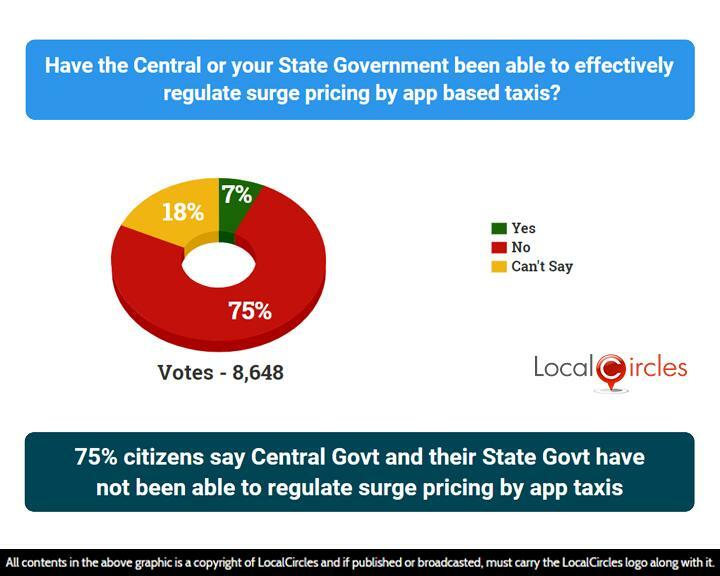 Following question asked if their state or central government has been able to effectively regulate surge pricing by app-based taxis. 75% answered in a ‘no’ while just 7% said ‘yes’. 18% were unsure about it. Although many app-based taxi companies started up in India, not many have been able to survive with Uber and OLA being almost the lone survivors, thanks to the millions that were invested in to them. Old operators like Meru have been struggling to keep their feet on the ground where as the smaller operators like Taxi for Sure have been taken over by OLA. 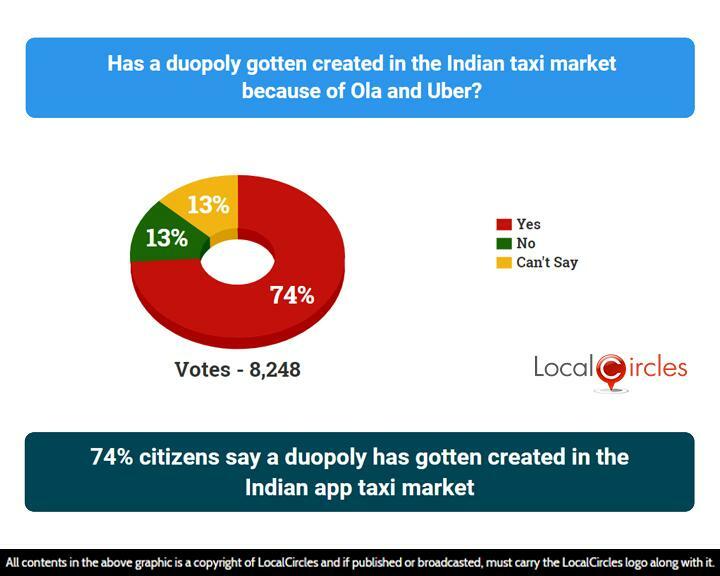 74% citizens also said that a duopoly has been created in the Indian app taxi market because of Ola and Uber. 13% said it was not the case while 13% were unsure about it. 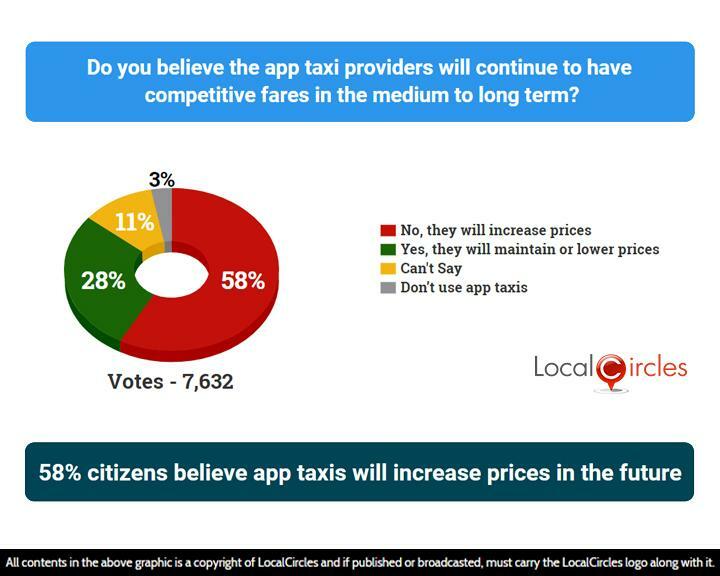 In the next poll, citizens were asked if they believe the app-based taxis will continue to have competitive fares in the medium or long term. 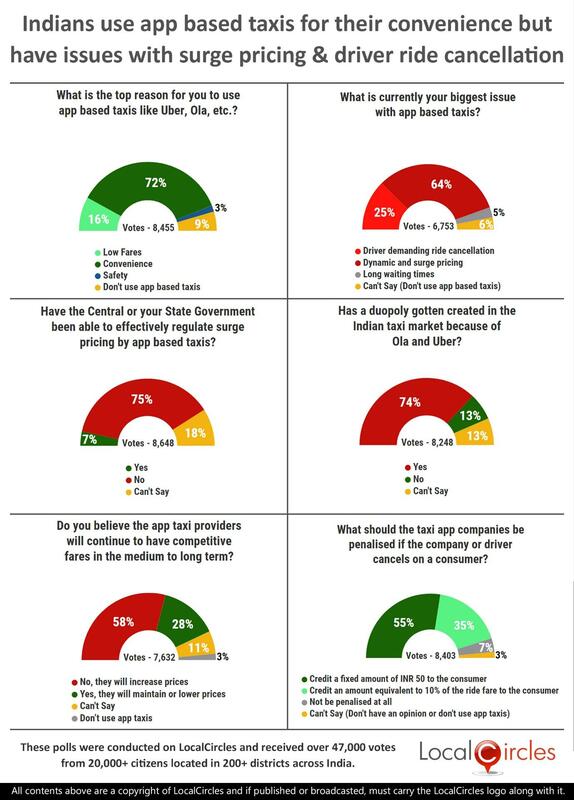 58% said they will increase the prices, 28% said they will maintain or lower the prices, 11% said they were unsure and 3% said they don’t use app-based taxis at all. The cases of drivers cancelling rides and leaving the passengers in a lurch are common. When the passengers book a cab, the driver calls them to confirm their destination and if does not want to go there, he either cancels the ride himself or asks the passenger to do so. The last question asked what the taxi app companies should be penalised if the company or driver cancels a ride requested by a passenger. 55% said a fixed amount of Rs. 50 should be credited to thee customer account while 35% said an amount equivalent to 10% of the ride fare should be credited to customer account. 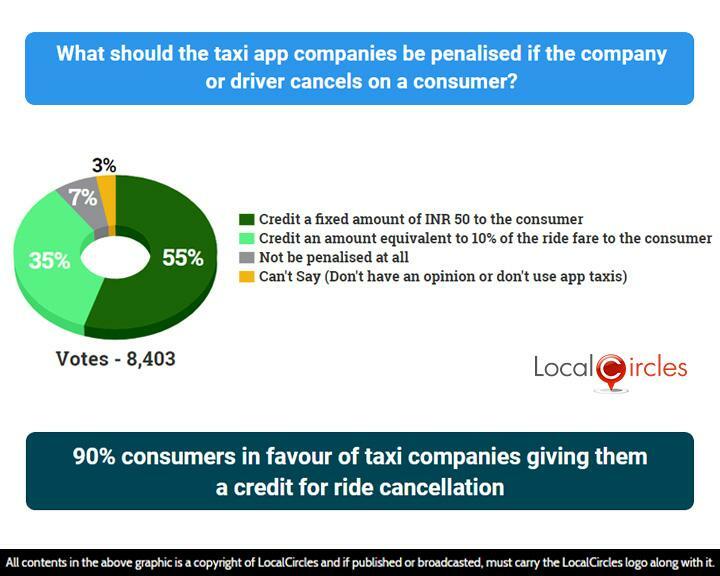 7% said to penalty should be imposed while a small 3% said they don’t use app-based taxis. Recently, there were allegations that Uber and Ola were indulging in price fixing which was resulting in customers having to pay a higher amount. The Competition Commission of India investigated the matter thoroughly and dismissed the allegations that Uber and OLA and imposing a resale price maintenance system on drivers as well as discriminating prices. Having said all this, although the app taxi services have brought a lot of convenience to the lives of the citizens, the government will have to take strong steps to control surge pricing mechanism and ensure sustainability of the services. 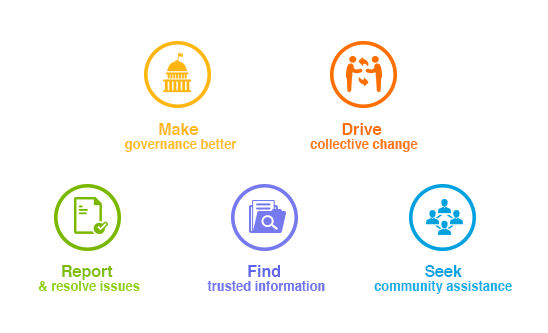 Over 47,000 responses were received from 20,000+ unique citizens located in 200 districts of India. Approximately 43% of the respondents were women while 57% were men. 58% of the participants were from Metro/Tier 1 cities, 32% from Tier 2 cities and 10% were from Tier 3 and rural locations.